Nominated by Calvin Coolidge on December 15, 1926, to a seat vacated by Henry Wade Rogers. Confirmed by the Senate on December 22, 1926, and received commission on December 22, 1926. Served as chief judge, 1951-1953. Assumed senior status on July 1, 1953. Service terminated on July 13, 1975, due to death. Thomas Walter Swan papers, 1918-1976. 2 linear ft.; finding aid; contains correspondence, speeches, photographs, awards, clippings, and miscellanea documenting Swan's career. 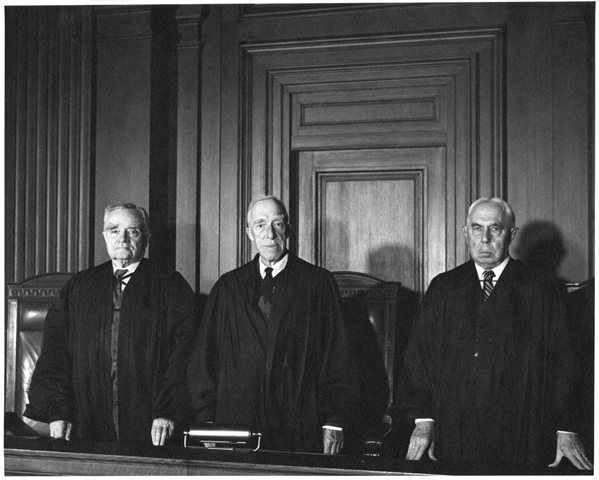 United States Court of Appeals for the Second Circuit judges [Thomas Walter Swan, center]; by Erich Hartmann; Group photograph; 1953; Learned Hand Visuals Collection, Harvard Law School Library, Cambridge, Mass., record identifier: olvwork371818. Reference image courtesy of Historical & Special Collections, Harvard Law School Library. Further reproduction prohibited without permission of the library. Thomas W. Swan B.A., Sterling Prof. of Law; by William Sergeant Kendall; Pastel on buff cardboard; n.d.; Yale University Art Gallery, New Haven, Conn., ref. #: 1945.137. Thomas Walter Swan; artist unknown; Photograph of oil portrait; n.d.; U.S. Courts Library for the Second Circuit, Thurgood Marshall U.S. Courthouse, New York, N.Y.